The only thing we've ever picked at the berry patch before is strawberries. But this year I really wanted to try my hand at other types of berries. 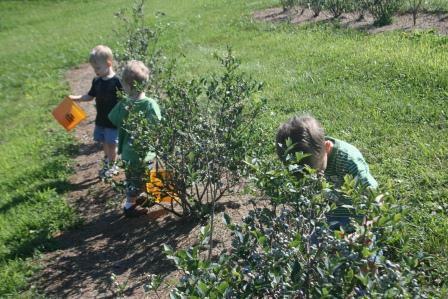 So the boys and I piled into the mouse infested minivan and headed to the berry patch. 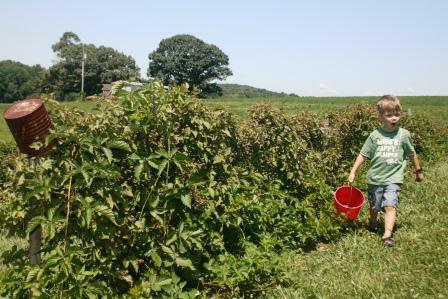 In season right now are blackberries, blueberries, and dewberries. Look how huge the blackberries were. Not all of them were ripe yet, but there were plenty for the picking. Dewberries are like small blackberries. They are more tender and have a subtle taste. I really enjoyed them. The blueberries weren't quite ripe yet. Oh, we found a few, but not as many as I'd hoped for. Most of the ones we found seem to have disappeared into little tummies. Now this? This was MY bucket. I worked hard to fill it up with blueberries, dewberries, and raspberries. Once we got home I made muffins, cobbler, and a jam. I am happy to say that my jam set up just right this time. It's Rural Thursday! Time to link up your stories of the rural life (or your wishes of one) with myself and Nancy from A Rural Journal. Everyone is welcome. Just copy the code below the button and paste it into your blog post. Then come back and add your webpage to the linky. Please be sure to visit the blogs of 5 other participants and leave them some comment love! All those berries look so good! 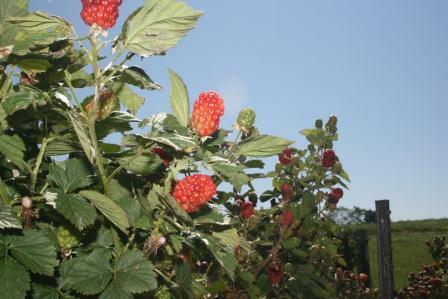 It will be a while until we have raspberrys or blackberrys, but we do have strawberrys now! Looks like you caught the berry thief "red-handed!" 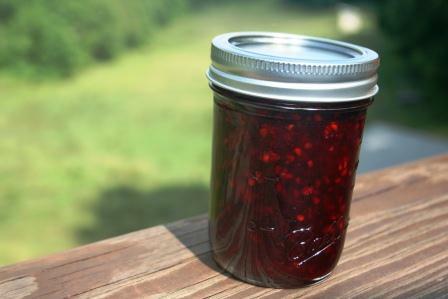 Your jam looks delicious! I think eating them at the patch is the best! How fun!! 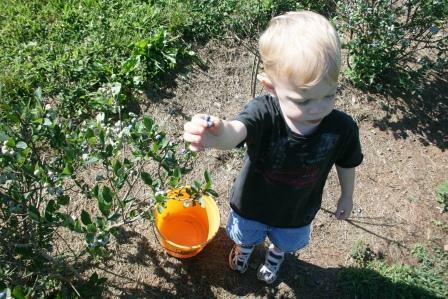 When my oldest goes berry picking more end up in his stomach than in the basket. Every child has a "tummy bucket" that gets filled first! That jam looks great. One of these days, I am going to try making jam with xylitol. Not sure how it will turn out. Fun, I love berry picking. I've never had dewberry. Looks like they had lots of yummy fun! Hi Lisa, I'm afraid that many of those berries would end up in my tummy also... BUT--glad you had enough for some muffins, cobbler and jam... YUM.. I love these berry picking shots! The boys are so cute. We moved a wild raspberry plant from the woods over to the edge of our porch. It grows like crazy, but we keep it trimmed back. 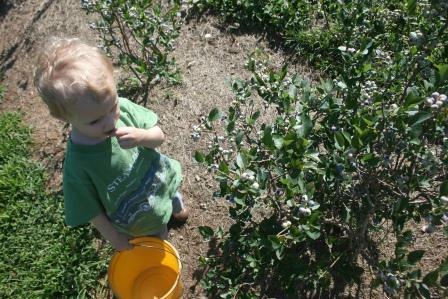 We get enough berries to enjoy picking and eating, but not enough at any one time for a recipe or anything. It's fun. The jam looks wonderful--such a beautiful color! 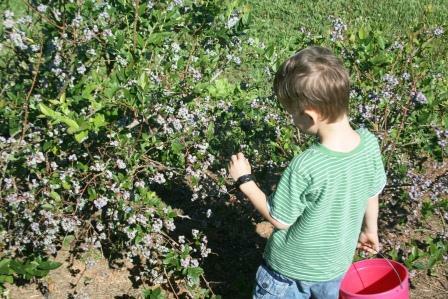 I remember picking blackberries on our farm when I was growing up. Definitely half of what I picked ended up in my stomach. LOL...mouse infested minivan. My mouth is watering just from the sight of that jam....it looks heavenly! LOL! I can see why buckets were not getting filled! That's not nearly as much fun as snacking along the way. Adorable shots! Excellent photos, pick strawberries, a job well done. I LOVE all the empty buckets the boys are carrying around! LOL!! We are the opposite of you guys right now...I picked 12 lbs of blueberries last weekend but our blackberries are not ready yet. I haven't canned a darn thing yet but my fingers are itching too!! A great outing for the children. 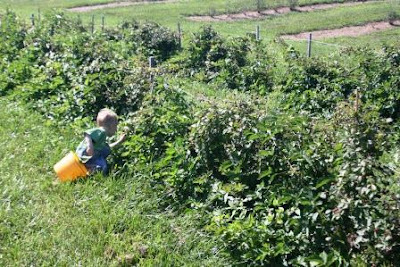 Boy, do I remember the work that went into making all that jam and freezing those berries when I was old enough to help in the kitchen at home. I know my little granddaughters last summer ate everything they found. The berries made my mouth water. Looks like it was a lot of fun, too. The boys will remember times like that. . .
you really are the fun mom and those boys could not be any cuter!! Your boys will remember berry picking for a long time! You all stay so busy. I bet the jam is great! I loved this post. It reminded me of one of my favorite children's books Blueberries for Sal. What a cute story, and so glad the cubs tummies were not empty at the berry farm! Jam looks great! Our black raspberries are ripening now and I have picked 2 pints - no wonder they are so pricy at the store - lots of thorns to battle, and our berries are the wild kind - not very large! There is nothing better than fresh picked berries! Your jam is beautiful! I love the color! I picked 3 strawberries yesterday, and soon my raspberries will be ready. Hopefully there will be enough for jam. I remember buying blackberries a few years ago and they were so huge that only a couple fit in the palm of my hand. Made me wonder what kind of fertilizer was used! As always, your boys are so cute!! I want to do that. I think our apple farms have some berries now! What a fun time you had. I have never had a dewberry, blackberries are my all time favorite! That looks like such fun! 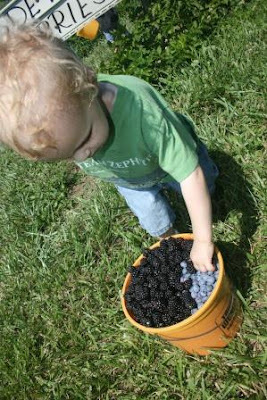 I might have had an empty bucket too ;) I love berries!